We all know that Kawasaki Genuine Accessories offer unmatched quality, fit and finish. 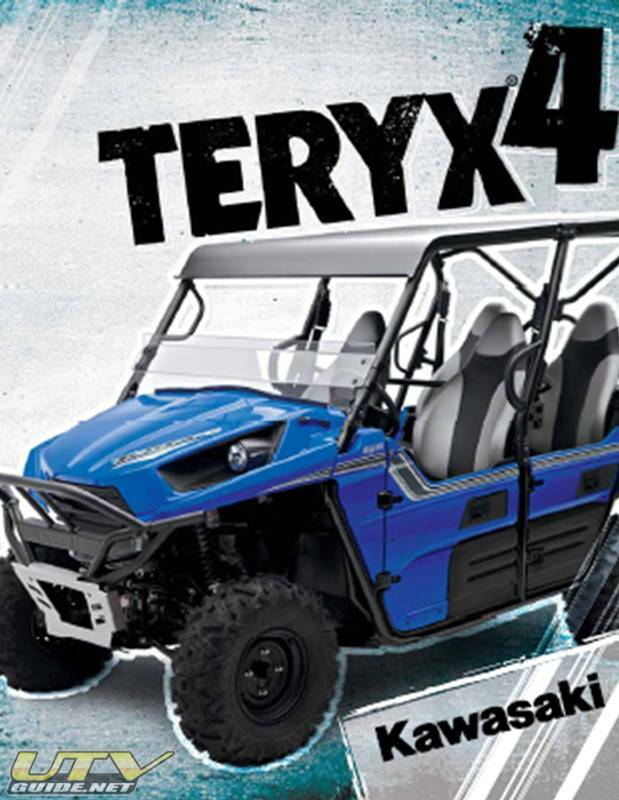 And for the new Teryx4™ Kawasaki stepped up to the plate and hit a home run with over 30 Kawasaki Genuine Accessories in stock and available for purchase at your local Kawasaki dealer. Whether you are looking for extra vehicle protection, comfort, performance or all of the above, Kawasaki has an accessory available to fit your individual need. Even more, you can rest assured that Kawasaki Genuine Accessories have been developed under the same strict standards as the Teryx4™. Each accessory must complete extensive testing with the Kawasaki R&D team to ensure proper fit, durability, performance and 100% warranty compliance. The following is a summary of the featured accessories currently available. For further information on these and more don’t forget to visit Kawasaki.com/accessories. A-Arm Guards – Protects A-Arm and drive shaft for use on rough terrain. Durable yet lightweight design. Brushed Aluminum finish. Front Bumper Cover – Durable brushed aluminum front bumper cover replaces the stock steel part. Brush Guard – Durable 1.5″ steel tubing adds protection and style. Textured black powdercoating matches stock bumper. Built-in mounting brackets for optional Off Road Light Set. Headlight Guards – Durable tubular steel design with textured black powdercoating. Protects headlights from debris. Aggressive appearance. Easy installation. Sold in pairs, hardware included for easy installation. Fender Flares – Extends fenders to offer protection from mud, water and debris. Textured, roto-molded design. Integrated OEM styling and fit. Tail Light Guards – Teryx4 tail light guards features durable 12 gauge steel construction for durability and a texture black powder coating for long lasting style. Sold in pairs, hardware included for easy installation. Rear Bumper – Provides extra protection for the rear of the vehicle. Durable aluminum construction, offered in brushed or texture black powder coated finish. Half Windshield – Directs airflow for a more comfortable ride. One piece design features a hard-coated, scratch resistant surface. Full Windshield – Provides protection from mud, sand, debris and weather. Fixed one piece design features a durable hard coated poly-carbonate material. Fits with all Genuine Kawasaki Accessory Tops. Soft Top – Teryx4 Soft Top offers additional protection from sun and weather. Simple, lightweight design requires no hardware. Long wearing UV resistant fabric. Plastic Top – Protection from weather and sun. Contoured, light-weight style with textured finish. Original Equipment on Teryx™ 750 4×4 LE model. Can use alone or with windshield. Winch Mount – Brackets and hardware required for mounting Warn winches. Rifle Case Mount – Black Tubular steel mount to carry two rifle cases (does not include Rifle Cases). Seat Covers – Durable, heavy gauge vinyl seat covers add comfort, function and style. Foam bolsters are sewn into the sides of the base cover that helps keep you planted in rough terrain. Cargo Box – Durable, lockable molded plastic cargo box features a double wall, insulated lid that rides on a gas shock for ease of use. Includes one cooler box that locks into a channel and still leaves room underneath for additional storage. Additional cooler boxes are offered separately. Simple installation with 4 thumb screws that re-use the original tie down hooks inside the cargo box. Snow Plow – Large 72″ tapered poly blade. 5 position blade angle. Commercial strength components. Quickly disconnect by single lever clamp. Lift by winch (order separately).